Brand daily lenses made from polymacon for dry eyes. Thanks to their reduced water content, SofLens 38 Contact Lenses keep your eyes healthy and moist. As a result SofLens 38 is the ideal choice for contact lens wearers who suffer from dry eyes. Further, lower water content reduces irritation caused by dry air in air-conditioned environments or during extended work at a computer. Reduced lens thickness supplies the retina with sufficient oxygen in spite of the lowered water content. Bausch & Lomb offers SofLens 38 lenses in three different curvatures (base curves), to match the needs of different wearers. SofLens 38 contact lenses are stored in care solution overnight. The light handling tint makes first-time use of contact lenses with SofLens 38 child's play. See for yourself the unbeatable savings on offer when you order multiple packs of SofLens 38 and cleaning products in the Mister Spex online store. Mister Spex advises all online purchasers of SofLens 38 contact lenses: the contact lenses, SofLens 38, should always be fitted to your eyes by an eye doctor or optician. The period between fittings, unless otherwise prescribed by an eye doctor or optician, should not exceed 6 months. You should go for regular check-ups. 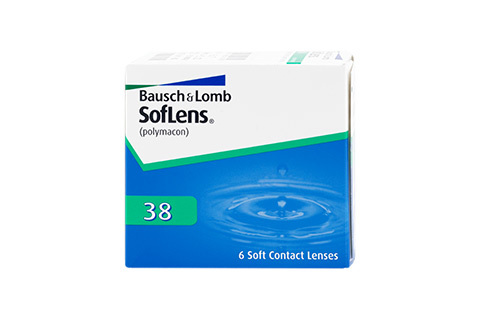 The manufacturer Bausch & Lomb/your eye doctor/optician's recommended wearing time for SofLens 38 contact lenses should be followed strictly. It is your own personal responsibility to make yourself aware of the care instructions for SofLens 38 contact lenses and to follow them accordingly. In case of eye irritation or visual impairments caused by SofLens 38, remove the contact lenses immediately and consult an eye doctor or optician. Damaged contact lenses should be replaced immediately.